Tiago Zortea listens in to ‘The Edge of Life’ on BBC Radio 4. A man who has survived the storm of suicidal thoughts and actions throughout this life explains: ‘I started to feel down, down to a point where it was uncontrollable… If I didn’t seek help, I would have tried another suicide attempt’.This 40-minute documentary on the devastation of suicide, and a new approach to suicide prevention currently being trialled in Liverpool, included interviews with people with lived experience as well as experts in mental health and suicide prevention. The programme was presented by Matt Haig, the author of the brilliant Reasons to Stay Alive. The central focus of the programme was on the potential of applying the American approach of ‘ Zero Suicide’ to suicide prevention in the UK. Zero Suicide started as an approach for treating depression with the aim of eradicating suicide deaths at the Henry Ford Health System in Detroit, USA. Although the approach has not been subject to an RCT, it has been effective in Detroit, with the proponents reporting a substantial reduction of deaths by suicide within the Henry Ford System including zero suicides for two years. Recognising suicide as an urgent problem, Joe Rafferty, the CEO of Mersey Care NHS Foundation Trust decided to prioritise suicide prevention across Merseyside – and he turned to the Zero Suicide approach. Rafferty made a bold promise: ‘We decided, as an organisation, that we are going to do something really different: anybody who comes into our services and who is in contact with Mersey Care should not die by suicide’. To start to realise this goal, in September 2015 Mersey Care NHS Trust launched their own Zero Suicide strategy, working with Professor Louis Appleby and his team at the University of Manchester to implement the evidence from the NHS about what works to prevent suicide. Although it is still early days, the implementation of the Zero Suicide programme in Merseyside has already changed staff’s perceptions and their approach to suicide, and service users have been positively affected by these changes. People with lived experience such as Angela Samata (who lost her partner to suicide; see BBC Documentary Life After Suicide) has also contributed to the implementation of the strategy. There are many challenges to reducing suicide to zero and funding for suicide research and prevention is imperative to achieve this goal, as there remain many gaps in our knowledge. Although the Zero Suicide initiative in Merseyside is still relatively new and there is a lot to do, the messages of hope and determination are stronger than ever, because suicide is not inevitable and the change for a better life is possible. - Tiago Zortea is in the Suicidal Behaviour Research Laboratory, University of Glasgow. 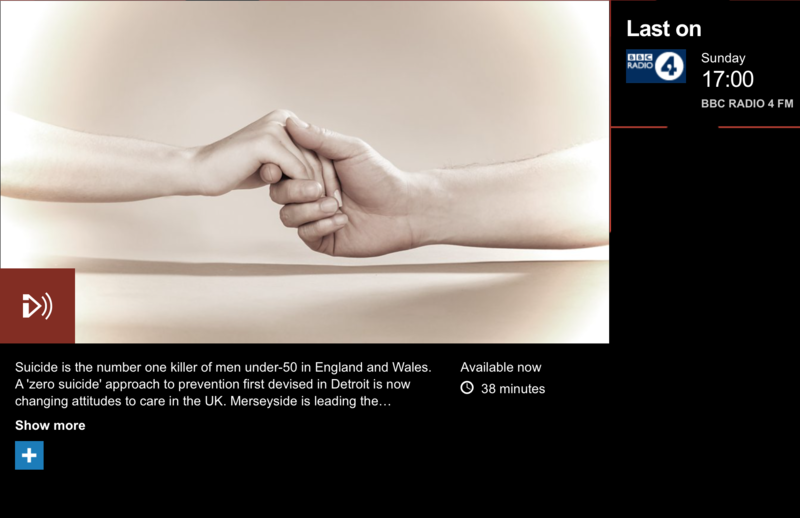 Find much more on suicide in our archives, and information and support on the BBC website. Listen to the programme now.